How to Get a Loan for Marriage ? Now that the D-day is looming near, you must be excited about the upcoming ‘most important day’ of your life. Pause for a moment and think – Are you financially ready to handle the expenses? You will need a lot more than just plain luck to pull off an intimate wedding. Prior to the marriage ceremony, you need to have all your finances in order as paying for all of the wedding expenses do take a toll on you financially. Many couples prefer to opt for wedding loans. Of course, you can’t just walk into a bank and apply for a “wedding loan”. To get a loan for a wedding, you need to obtain a personal loan that will serve to fund your special day. Why Should You Take a Personal Loan for your Wedding? When it comes to planning a wedding, the expenses related to the venue, catering, entourage attires and the number of guests invited for the occasion among other aspects need to be taken into consideration. As the average cost of a wedding is increasing by the day, many persons exhaust all of their life savings just for that one, perfect day. This is not advisable and so the only safer alternative lies in getting marriage loans. Most banks and lenders approve personal loans for weddings without any hassle. You can opt for a personal loan, depending upon your requirement and financial standing. If you have a good monthly income, you can even ask for bigger installments. This helps to cut down the shelf life of the loan to a great extent as you can repay the amount faster. Alternatively, you can even choose smaller EMIs and a longer loan term. How do Banks Decide Marriage Loan Eligibility? Bank loans are granted to people based on whether individuals are eligible for the loan or not. This is mainly determined by your monthly income, interest rates and loan tenure. The loan interest is calculated based on the following factors. Your credit score and credit history. Banks normally look for a credit score of 750 and above. The company you work for. For large, reputed companies, banks even give out special schemes that come with better interest rates. Your overall monthly income, that is after deducting any EMIs and fixed obligations. Your profession is also taken into consideration. When compared to self-employed professionals, the loans for salaried customers come at a lower rate. When you want to get a loan for marriage, you need to keep the following factors in mind. Roughly estimate your loan requirement after planning your wedding budget. Compare and contrast between multiple banks who are offering you different interest loans and how the interests are rated. 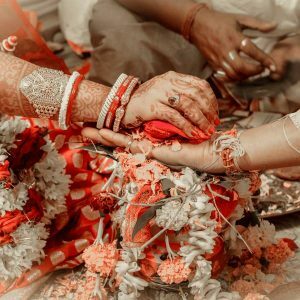 You can save up on a lot of interest, additional charges and processing fees when you meticulously check and opt for the right loans for the wedding. Make a note of your estimated loan requirement and compare it with the loan EMIs you can afford. In this manner, you can adjust your loan’s amount. If you are not careful, personal loans can leave you with a high rate of interest and at this rate loans can turn to become stifling. So remember to stick to a careful approach and keep things within budget. How Do You Get a Wedding Loan? Make certain you have good credit. If you get a loan with a credit score that is lower than 750, you have to pay more for it with a higher interest rate. Keep all of your financial documents in order and ask you bank about the required documents that will need to be submitted. Your bank will let you know about the available wedding loans so you can choose the best one. Marriages are made in heaven but choosing the best personal loan will help you have a great celebration right here on earth.